This church consists of a rectangular nave with a straight end choir in the east. The nave has an attached porch on the southwest side and a sacristy on the southeast. The oldest parts of the church likely date to the end of the 1400′s with the porch added a little later at the beginning of the 1500′s. The church has several older fixtures hinting that it likely had a predecessor from sometime in the middle ages. The church rests on unstable moraine soils deposited from the retreat of the glaciers at the end of the ice age which have caused it to settle, cracking the walls. In 1748 extensive repairs were carried out, enlarging the windows at the same time. 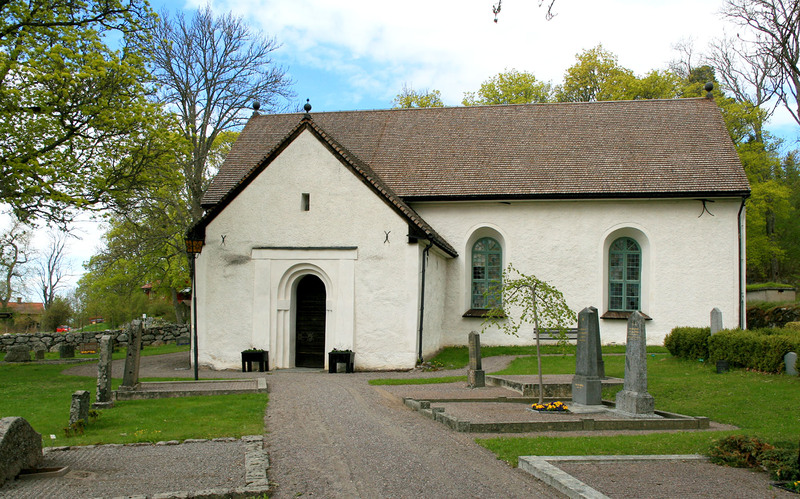 At the start of the 1800′s, the parish vicar tried to persuade the assembly to close the church and hold services at Biskopskulla Church. Instead an unanimous vote led to comprehensive restoration. The leader of the work was a castle building master from Roserberg Royal Estate. To save the walls, it became necessary to demolish the medieval brick arches and replace them with a wood barrel vault.